Would he rush through your slogan, or belt it like a battle cry? Taglines. Companies love them. Some real people notice them occasionally. And others think they're outdated or stupid. Some brands have ditched them completely. But they aren't going away any time soon. Taglines also have a shorter shelf life than ever, constantly at the mercy of new marketing directors with new marketing directions. So if you're a copywriter, you'll probably get a new tagline brief soon. But when you write a tagline, how do you know it's great? There's one simple test that my old buddy, Ken Ratcliffe, and I found to be very reliable: Read your tagline out loud while pretending to be Al Michaels. 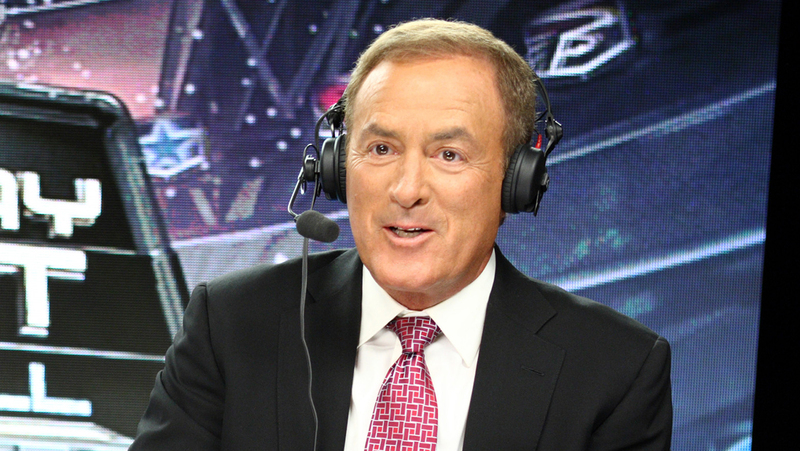 Al Michaels, as you know, is the legendary co-host of Sunday Night Football and, for me, the voice of the game. When he's not commenting on the play-by-play action, Al has to banter, throw to commercial and, most importantly for ad people, read taglines. Yes, you'll notice when you watch the Sunday game, Al has to not only acknowledge sponsors by reading their names out loud, but also by reading their taglines. And it's pretty apparent that when he does this, he really doesn't enjoy what he's doing. You can hear the weariness in his voice, the imperceptible sigh of disgust that he is—if only for a brief moment—reduced to shilling products live on air. "This is not me," you can hear him saying. "I am the voice of the great game of football, not a common pitchman. They might as well make me sing a [bleep]-ing jingle." But no, the network made some back-room deal that has poor Al stepping in line and ponying up a tagline in his deep, Kermit-the-Frog-meets-Peter-Jennings voice. Also, almost imperceptibly, you can hear Al judging the line itself. If it's too silly or too long or contains the word "awesome," Al can destroy it with a tiny pause or a misplaced inflection. If a line is too pithy and empty? Al will reveal it as such. Short, vapid lines like, "Bring the good," "Do more" or "Life is happy" get ripped by Al as the empty, overly broad slogans that they are. Imagine, for example, if Al read Sara Lee's old line: "Tonight's broadcast brought to you by Sara Lee…Heck, you don't need a fork…Second and nine on the Packers 30…"
I'll bet you'd be able to hear Al's eyes scraping the back of his sockets with a huge roll. "Heck" is a word he would use, but being forced to use it is a different thing altogether. You'd hear his confusion halfway through the line, as if to say, "THIS is what they went with?" No wonder this line was pulled. But bring, as Laura Ries called it, a battle cry, and Al's Sunday night sense of competition and triumph will radiate through. "Tonight's broadcast brought to you by MasterCard…There are some things money can't buy. For everything else, there's MasterCard…Fourth and inches for Philadelphia…"
Al might rush that one. Still a good line. "Brought to you by Lexus…The relentless pursuit of perfection…Manning shaken up after that last play…"
He would nail this one. He'd probably land hard on "Lexus," then slightly pause and inhale, building anticipation, giving due honor to one of the great lines of all time. And then he'd dive in, pausing once more just before "of perfection," in order to really bring that sucker home. It would be beautiful. If, however, it was just "Pursuing perfection," I think he'd rush it and therefore not care. Perform the Al Michaels Test, and some taglines get their rightful glory, while others reveal their shallowness and get met with boredom, impatience or confusion. Forget focus groups and qual/quant whatever. Al's very, very, very low-level annoyance is the best barometer for whether or not you have a great line. Ted Royer is chief creative officer of Droga5.